I haven't actually bothered to do anything more interesting with the phone, just thought I'd post some notes. The link doesn't appear to be working right now, but maybe it will get fixed. Sadly the cubot.net site also appears to be down at this time, so I wasn't able to get the firmware straight from the company. The phone is really, really cheap now, BTW. 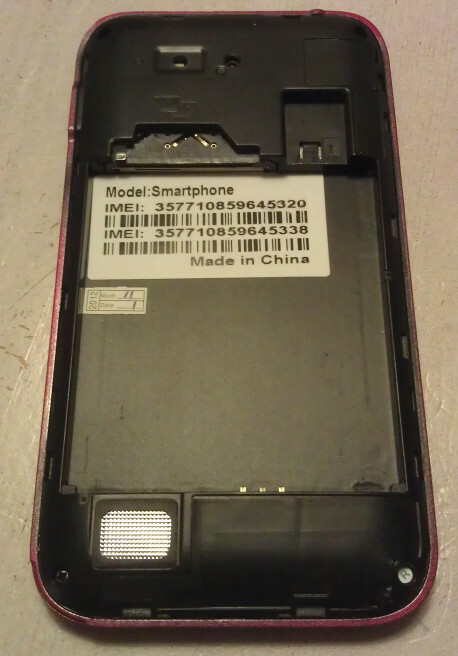 Recently my main phone had some problems, and I was faced with having to send it for repairs. While I have an old mobile phone I could use in the meantime, I was not looking forward to being without a smartphone for days or weeks. 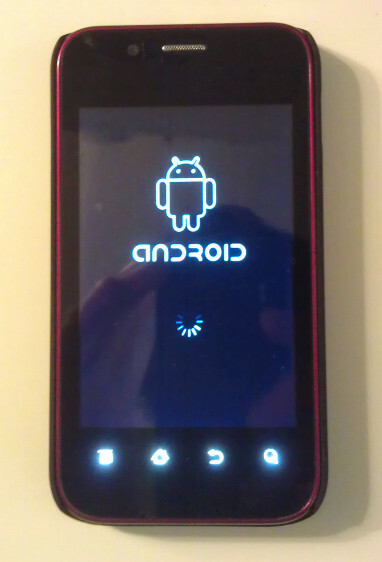 So I thought to myself, "I wonder if I can get a cheap Android phone as a backup?" It turns out the answer is "YES". My research was pretty standard: see what Google comes up with. I ended up looking at a site called Chinavasion, which seemed more-or-less reasonable. I checked for reviews, and the results were mostly positive. 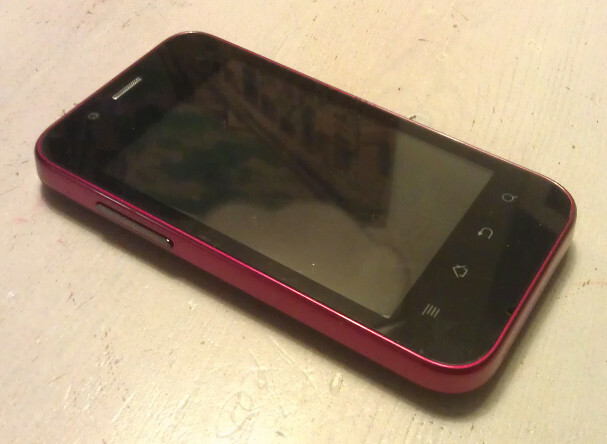 I decided that since the phone I was thinking about was so cheap, that I would give it a chance. I ordered on Friday, which was already the weekend in Hong Kong. I'm not sure if Chinavasion ships orders on the weekend, but this wasn't sent until Tuesday. I guess next-day shipping isn't that important in a wholesale business. After impatiently watching the shipping progress online, finally the happy day came when my shiny new toy arrived. I didn't take pictures at the time, but I still have all the stuff, and have put together a simulated unboxing for your viewing pleasure! 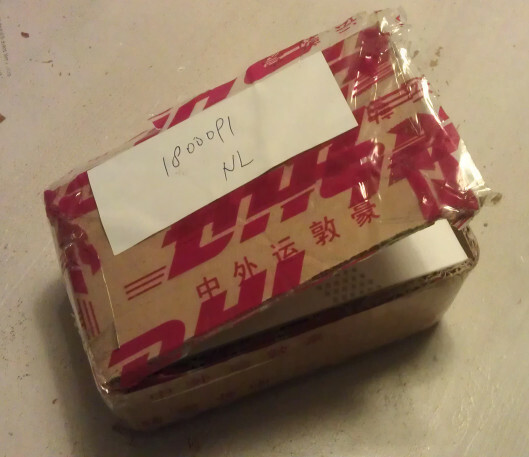 The shipping box has Chinese writing on it, which is cool. 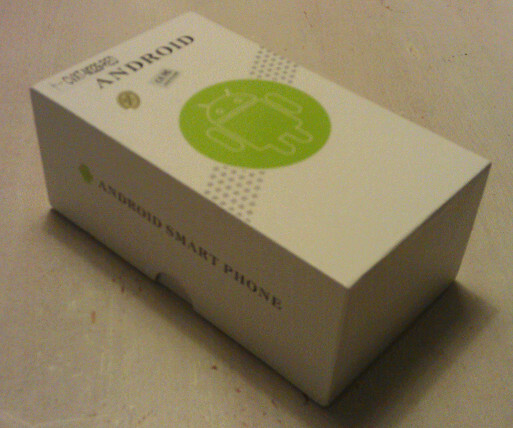 The box of the phone itself is deliciously generic. ANDROID SMART PHONE indeed! The back of the box has options, presumably these should be checked with what is actually inside. Instead, they show me what I didn't get, but could have if I wasn't so cheap. I was pretty happy with the contents. Included are two batteries, which is cool. As Montgomery Scott knows, you can never have enough power. The headphones include a microphone for phone calls. They are crappy headphones, but I have had worse. I haven't actually tested the microphone yet, but presumably it is functional. The charger has a micro-USB cable that can be disconnected and used to connect to a USB port on a computer or the like (although the cable itself has already degraded a bit, with the outer casing pulling away from the base as you can see in this photo). It has a red light that comes on when plugged into the wall; I'm not sure if this is good or not. It lets you know that it is working, but it could also mean you have an annoying glowing dot next to your bed at night, and uses a bit of electricity. There are a couple of case protectors also, in gorgeous lime green or basic black. 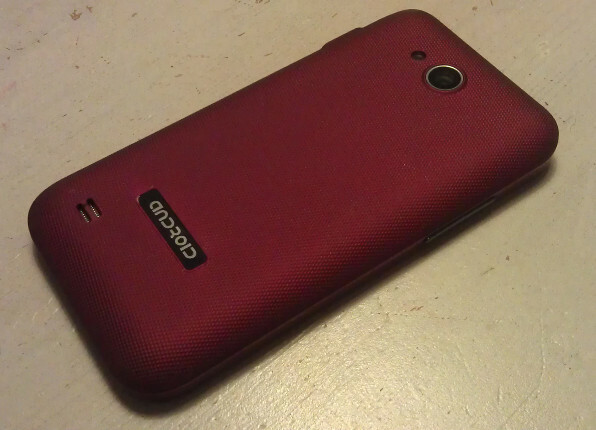 The lime green is probably awesome if you have a white or black phone, but not so helpful with the red phone I got. Rounding it out is an instruction manual, which I actually used because I'm never sure about whether I should charge before use, and so on. The phone itself is, well, exactly as expected. I think it looks rather nice. Inside of the back cover. It says "Music", for some reason. And also "High resolution smart phone". The model is... um... smartphone! It boots into generic Android mode. The first thing I did was basic preferences settings, such as turning off the sounds when touching the screen, turning the screen timeout way up, setting the date/time, and enabling wireless. After that, I could explore the phone a little. My previous experience with an Android phone is with my HTC Sensation XE, and a very little time on my wife's Samsung phone. I gather HTC has their own funky interface, so I'm not really sure what a "normal" Android setup is supposed to look like. 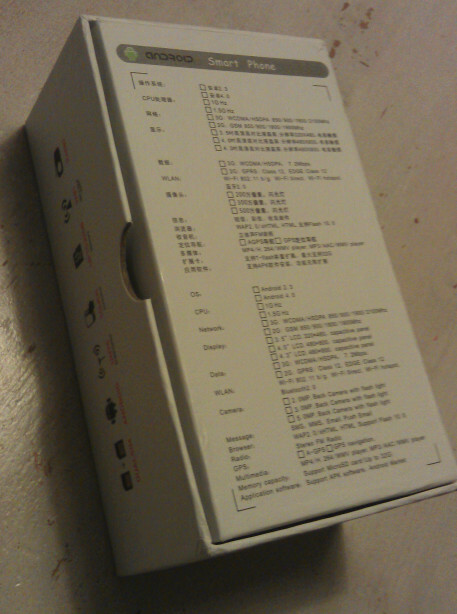 The Chinavasion phone has some standard Android software missing, and has added quite a bit of GO software. For example, the main launcher is the GO Launcher, the GO Keyboard gets configured as soon as you try to type anything, GO Weather is on the main screen, and so on. Google Play works as expected for updating and installing applications, although it reports the phone's model as HAPPLE. Yes, HAPPLE. The first real problem I had was that the WiFi (802.11g wireless) didn't work very well. After a lot of debugging, it turns out to not play nicely with either my TP-Link WR1043N or my Linksys WRT54G base stations, losing something like 50% of packets just pinging the base station. Fortunately it seems to work fine with my older Asus WL-300g. I have used the phone in coffee shops and museums, so perhaps I just got unlucky. It doesn't fill one with confidence though! A further oddity is that the WiFi uses a locally administered MAC address. While it seems to work - since it is the only device in my setup that has such an address - it is technically incorrect to do so, and makes me wonder if the wireless chip vendor was unable to get a OID from the IEEE for some reason. The phone has room for two SIM cards, which is cool, although I only have one SIM card so I can't really report on how well it works with two. I think it will be nice on travel, to get a local pre-paid SIM and still be able to receive calls and SMS on my normal SIM. One problem with the SIM configuration is that there were no access point names (APN) setup at all. I guess it is not reasonable to expect the phone to have my local provider, but it seems weird that there are no APN. After trying to get the proper way to configure this from both my provider and via google, eventually I ended up copying this from my existing Android phone, and was able to get data networking (see footnote 1 for details). Sadly the phone is only 2G. It didn't occur to me that someone would sell a phone that can use the mobile phone network to get on the Internet and only support 2G in 2012, but it is quite clear on the web page selling the phone. Mea culpa. 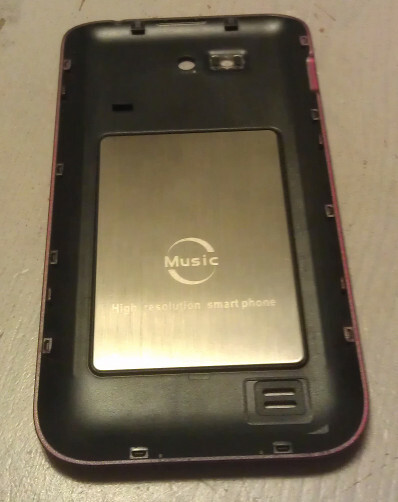 The phone has quite limited internal storage, so really needs a Micro SD. I happened to have an old 4 GB Micro SD lying around, so decided to use that. It quickly became obvious that even moving applications to the SD card was not going to leave enough space, since parts of the application were still on the phone's internal memory. Fortunately, there is a solution for this problem: Link2SD. It involves setting up a separate partition on the SD card and copying everything from the applications there. In order to use this, however you need to root the phone. So I did this (see footnote 2 for details), installed Link2SD from Google Play, and was off. A side benefit of rooting the phone is being able to uninstall bundled applications that I don't use, such as the Persian and Arabic GO keyboards, and Twitter. At this point things seemed to be going good, and I installed and configured lot of my favorite applications, like Facebook, Google+, Yahoo! Mail, built-in e-mail (IMAP and SMTP work fine with SSL), Skype. No VoIP seemed to be present, so I installed CSipSimple which seems to work really well. Since the phone is rooted anyway, I went ahead and installed Titanium backup and back everything up with that. Sadly the phone doesn't have any way to synchronize with Google Calendar, or the Google Contacts. The phone has a built-in local calendar, but when you register a Google account on the phone, it disappears and there is no way to create another calendar. The lack of these features doesn't make a lot of sense, but I was able to find a workaround: Google supports the CalDav for synchronizing with Google Calendar and CardDav for synchronizing with Google Contacts. When using CalDAV-Sync beta, the Google Calendar appears as a normal system calendar and works with the GO Calendar widget and alarms work as expected and so on. Like the lack of 3G, the lack of GPS also came as a surprise to me. And like the 3G, it is an oversight for me not to have spotted it. To be fair, I did not think that the lack of GPS would be such a big deal. It turns out that a lot of applications use GPS to provide handy services. For example, the 9292ov application gives you the option of planning a trip using public transportation from your current location. Unfortunately, this means that they require GPS, and you simply cannot install them on a phone without one! So Google Maps, 9292ov, and a host of other applications that you probably never would have thought to use GPS for, are simply not available. The phone works! In the end, apart from the GPS issue, the phone is able to do everything. I can take and make calls, text messages, take photos, browse the Internet, download and listen to podcasts, track my calendar, play YouTube videos, and so on. Yay! However... it is slow. Very slow. I don't know if this is because of the Link2SD use, or because of the GO Launcher, or because of memory constraints, just limited CPU, or what. What I have done is installed an application that reports CPU usage in the notify area. If it says 100% then I wait before trying to do anything, since key presses and finger slides and the like seem to get queued and end up on the wrong place. 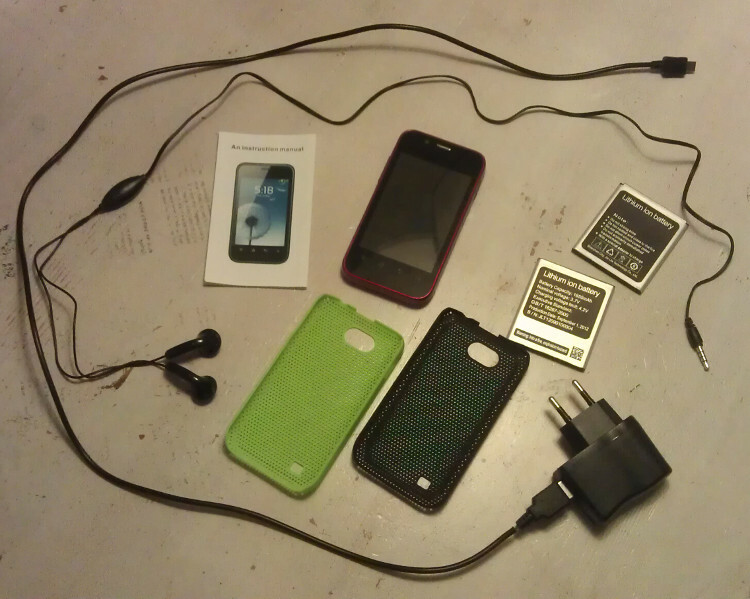 In the end, after a bit of hacking the phone is usable and actually fairly full-featured. I probably would not recommend it for most users, however. A power user would be better off doing a little more research and getting something with GPS, 3G, and a more recent version of Android, or possibly one that can be flashed with CyanogenMod. A "normal" user would be better off getting a slightly more expensive phone that "just works".